This is another of the seafood stews that we love. It was introduced to us by Paul Prudhomme in his book, Louisiana Kitchen published in 1984. We have been cooking, eating and modifying it for over twenty five years. In it's present form, the recipe is easy to cook, quite colorful and utilizes the seafood that can be obtained almost anywhere. 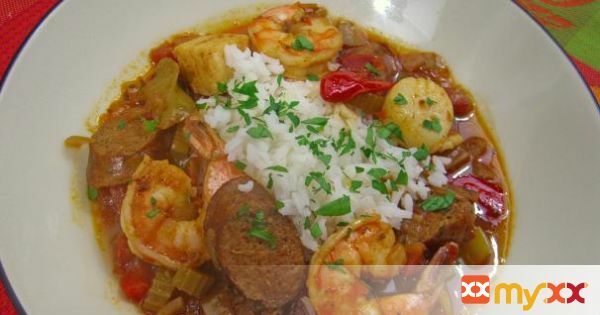 It is delicious; utilizing a roux and andouille sausage to obtain the famous Cajun flavors. If you love seafood and gumbos, we recommend this one highly. 1. 1. In a small bowl, combine the seasoning ingredients and set aside. 2. 2. In a medium bowl, combine the onions, peppers and celeryand set aside. 3. 3. In a lightly oiled 5 ½ quart Dutch oven, brown the sausage rounds over medium high heat and set aside. 4. 4. Add the ½ C oil and when it starts to smoke, slowly combine the flour and cook while whisking until the roux reaches a dark reddish brown color. 5. 5. Immediately add half of the vegetables and stir in for 1 minute. Then add the remaining vegetables, mix thoroughly and cook for 2 more minutes. 6. 6. Add the seasoning mix, stir in well and cook 2 more minutes or so. Then add the garlic, stir in and cook for another minute. 7. 7. Add the fish stock or clam juice and, mix well, bring to a boil and reduce to a simmer; then simmer this for about 30 minutes covered. 8. 8. Add the reserved browned sausage rounds, the crab, shrimps and oysters with their liquid and cook over medium heat for about 10 minutes stirring occasionally.